There’s a strange thing goes on inside a bubble. It’s hard to describe. People who are in it can’t see outside of it, don’t believe there is an.. outside. Once you’re in a bubble, it needs nerves of steel to stay out. Can you imagine the pressure? On any trader? I would like to start with a general statement borrowed from Hommi Bhabha which is as follows: all nations, one way or another, are tied to the narratives they tell themselves about themselves, including both the “what” and the “how” of the telling (1990: p.3). 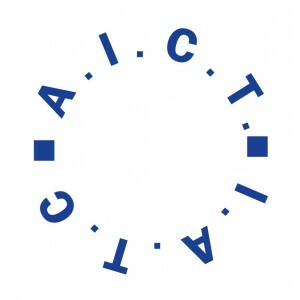 With this in mind, any serious disruption of the “various cultural activities and structures people engage in, from reading newspapers, to shopping, to making or watching theatre performance” (Harvie 2005: 4), inevitably creates a rupture between the individual and the collective concept of the nation. Whether one thinks of crisis in political, financial, environmental, ecological, ethical or other terms, we are talking about an event that leads, or is expected to lead to an unstable and dangerous situation affecting an individual, group, community or whole society. A case in point is Greece, whose economic collapse has led to a severe questioning of the ways the nation and its people see themselves and project themselves to others. Almost four years have gone by and people barely know what is really going on, let alone whom to blame: the politicians, the malfunctioning state structures, the left, the right, the Bankers (or “Banksters”), the International Monetary Fund, Europe’s Central Bank, globalization, Europeanization or themselves? No matter whom you blame, or how you look at it, people are caught between a failed past and a frightening future. What they were sure was there, has disappeared behind a vaporous wall of clouds. What was a “there” there, has given way to shifting signifiers. It is obvious that what present day reality calls for is a painful period of redefinitions and a new poetics of representation. We live in a world where identity politics go hand in hand with identity crisis: Who am I? Who are they? Why me? Of course, there has always been an identity crisis in all societies and their theatres. We are not the first to wonder how Real reality is. Oedipus took care of that for all of us. And so did Pentheus in The Bacchae at the moment the ecstatic women are about to tear him apart. He barely has time to tell the difference between the Original and the original. His failure was that he did not recognize there was a fundamental wrong in what he was about to do. It surely is hard to recognize a sickness, yet I think this is a necessary first step to salvation. To go beyond this crisis, people must first accept the fact that hubris comes before nemesis. It happens in all (tragic) dramas: the moment of recognition opens the way (painful as it is) to knowledge. And since our concern here is theatre, what about it? Does it remain immune to all this? Does it have a role? A place? It is common knowledge that whenever and wherever there is crisis someone will always show up to turn it into drama. It is only natural for theatre to show an interest in what is happening. 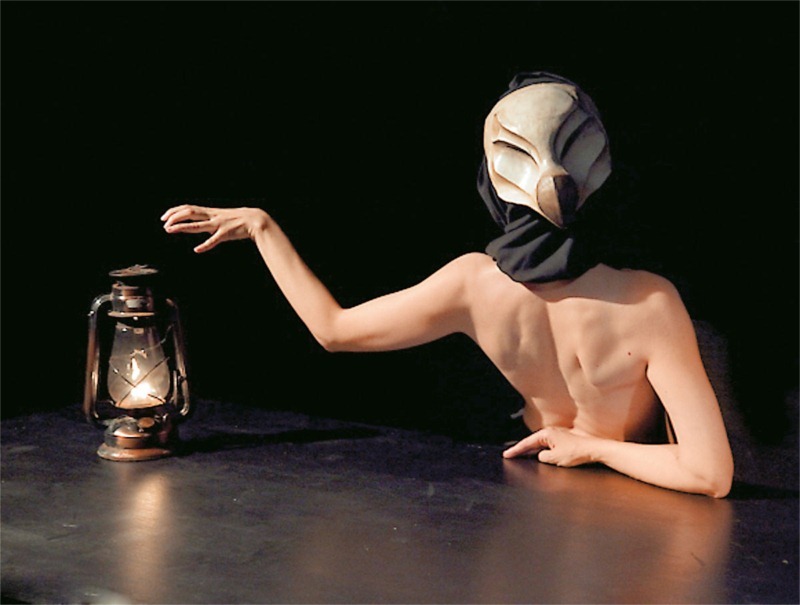 After all, theatre is not only about making (poetics) but also about making sense (hermeneutics). The question, of course, is this: what play is best suited to describe all this? I am not arguing that there is an established formula of the state-of-the-nation play. Critics seem to agree that the term applies “to works that have the nation, preferably in some sort of rupture, crisis or conflict, at their core” (Holdsworth 2010: 39). If we accept this description, then the cases of the Greek National Theatre in Athens and that of the State Theatre of Northern Greece in Thessaloniki are quite revealing because in a society where most theatres weather financial hardships, they assume “a level of importance as flagships of [the] nation’s culture” (Barker 1992: 24). The two of them, with an average of twenty annual productions, take the lion’s share of available subsidy, which consolidates their power, to the detriment of other theatres and companies. For the 2011-13 season they both used, as their guiding principle for the finalization of their repertory, the idea of the homeland. That is, they decided to make their public presence strongly felt by selecting plays that touch upon issues which have to do with the component parts of the nation, and its national character, plays which directly or indirectly foreground key narratives of nationhood as well as ills befalling the society. 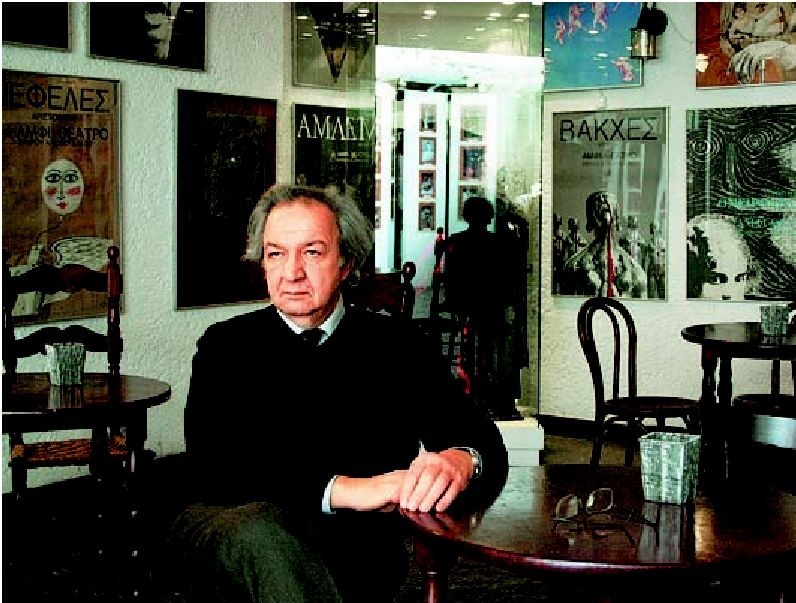 On his part, the artistic director of the State Theatre of Northern Greece, Sotiris Hatzakis, justified his choices by saying that “the country needs exemplary models and high moral standards. It needs a strong morale and belief in its own present and future. Love for the country, self sacrifice, heroism, social camaraderie and unselfish struggle are virtues that belong to all of us and claiming them we keep our country’s history alive and we offer our children a better future” (Aggelioforos 18/11/2012). In their own ways, the two theatre directors emphasized the centrality of the nation “as a mode of thinking and action that stresses the importance of national autonomy and national identity” (Holdsworth 2010: 27). By re-associating their theatres with the more pressing concerns of national life, they somehow looked as if they had a mission not only to represent the nation but also be a vital tool of nation re-building. It is historically evident that a nation in crisis most of the time retreats behind national boundaries. Radical social changes quite often trigger equally defensive, offensive or inventive (it all depends who is in charge) ways to inspire the audiences, engage the communities and also discuss burning national issues that directly affect their life. So, by choosing to directly appeal to the audience, the state theatres targeted more “active culture” and citizenship (Rebellato 2009: 54). At the same time, one has to ask: did all these choices manage to conceive of the nation as a whole, to conceive of its diversity? Whom do they represent? Whose stories do they tell? Do they provide spaces for debate? Do they bring forward multiple perspectives? Are they hospitable to otherness? Do they embrace the messy, the dangerous, the unpredictable? We have to admit that many of the productions, mainly the ones put on by the National in Athens, were polished, fresh and nicely presented. Some were hospitable to new ideas and current problems and others, such as Bob Wilson’s Odyssey, albeit aesthetically beautiful were, content-wise, more detached. The initiative of the State to take productions to people unable to attend theatre must not go unnoticed. 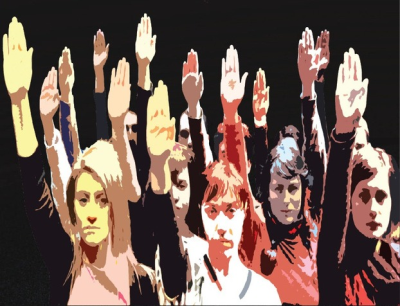 Equally laudable is its initiative to take the young actors starring in its antifascist production of Ron Jones’ The Wave (2013) to various high schools to meet young students and discuss with them the play and the dangers of fascism, now on the rise among young people. Also commendable is the willingness of the National in Athens to provide space to experimental (and “homeless”) groups to present their work, although this latter issue raises a number of questions. For example: how does a radical group fit into the heart of big state institutions of hegemonic control? Can they subvert them from within? Or, to turn the question around, can the institutions overpower them and render them sterile? Or, is what finally prevails something in-between: the artists compromise and the institutions change a bit to accommodate their work (Barker 1922: 25)? The poster of the production “The Wave” (2013) by the State Theatre of Northern Greece, a play concentrating on the dangers of fascism. Although one may claim that there was still room for a riskier, more estranging, alienating, self-reflexive, politics of form and more de-stabilizing, de-familiarizing and interrogating (regarding the power of naturalized cultural forms) in its politics of function (the spectator/spectacle relations) (Holderness 1992: 13), overall I think that the National, in particular, did manage to generate “emancipatory interruptions” (Gilroy 2004: 75), that is micro-narratives giving witness to the experience of particular groups as well as to new meanings and new ideas directly related to who we are and where we are going. This being said let me add that Greek theatre is not just the two nationals or the eighteen regional state theatres. As it stands now, it is impossible to provide an informed or coherent history. At no point in Greece’s history has there been such hectic theatre activity. For more than a decade, Athens alone was the host of about 450-500 new productions a year, put on by 230-50 professional or semi- professional companies, which involved 2.500 Equity members, hundreds of non-members and dozens of old and new venues all over town (about 130). 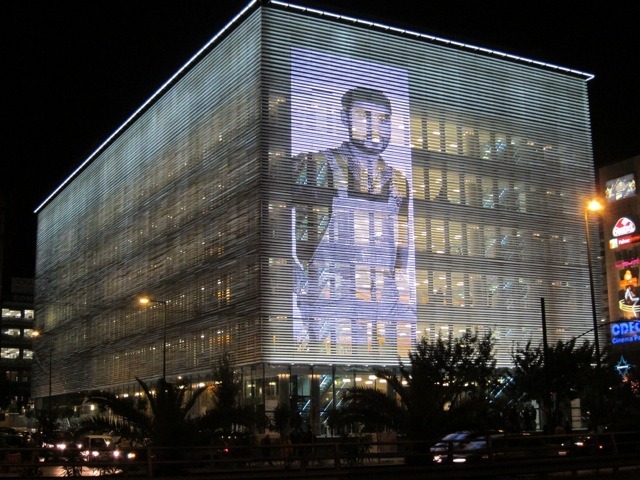 In 2009, the first year of the country’s economic downfall, the Onassis Foundation inaugurated its impressive cultural center in Athens (The House of Arts and Letters) with a clear mission to promote modern cultural expression, to support new Greek artists and to cultivate international collaborations. Its repertory policy gave theater-goers the chance to see, during the winter months, some of the biggest names from the festival circuit (i.e. tg STAN, Cheek by Jowl, Lepage, Kentridge, Jon von Jove, DV8 among many others). At the same time, Athens’ summer festival continued increasing its fans with its extrovert policy which included, among others names like Warlikovski, Korsunovas, Ostremeier, Stein, Fabre, Hall, Brook, LeCompt, Cassiers, Lupa, Rimini Protokoll, Forced Entertainment and Breuer. An average of 400.000 theatre-goers attend its shows every summer. There were without doubt interesting, inviting and promising ideas, trends and shows all these years; no major European author or director was ignored. New local directors and playwrights showed up with fresh ideas and an ever growing crowd of mostly young people began showing up at venues with alternative shows. Yet the greatest part of Greek theatre was still employed to reassure and comfort, to offer instant gratification rather than provoke or surprise. The more affluent our society grew, the more theatre it consumed. The hedonistic ethic, which for well over twenty years has dominated a large part of Greek society, created a generation of theatre shoppers rather than viewers. Consumption has worked its way down from the “eyes, ears and emotions to the digestive organs of the theatre-goer” (Fuchs 1996: 131). Theatre gradually became the ideal lifestyle of the whole society. It provided the fairytale glow that “Real” reality lacked. No one could see the real behind this mesmerizing cloud of happiness. The kitschification of local culture blunted not only our vision but also any potential radicalism intrinsic in the art of theatre. The transformative and transgressive potential of theatre was exhausted in mostly contained stage adventures which, in their own way, albeit unwillingly, were reproducing rather than challenging the dominant order. Like all fairytales, however, this one too had to end sometime, somehow. The economic slump has dramatically changed the geography as well as the function, the aesthetic, and, above all, the mentality and the morale of many local theatres. As of 2010 the scarcity of state funding has led to huge debt, unpaid rent, difficulties in meeting staff payroll. Full-time positions and overall seasonal positions have been slashed. Production in materials and support services are cut. Shorter employment contracts introduced. Even companies which for many years managed to maintain impressive standards have run out of steam (i.e. 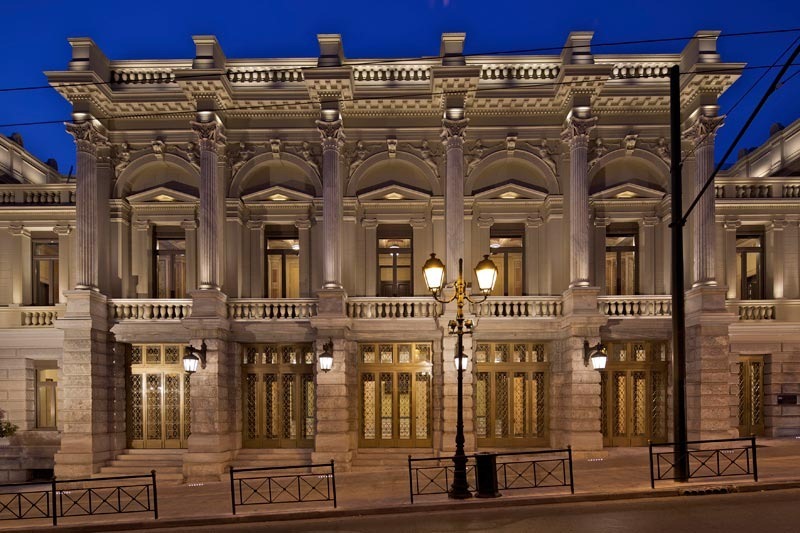 Aplo Theatre, Theatro tes Anixis, Amphitheatro, Piramatiki Skini, among others). Almost four years have gone by since the austerity measures were introduced and the options are obviously getting fewer and fewer for everybody. Especially in the mainstream theatre market one may talk of only one option: the closing of the theatre which cannot break even at the box office. What is quite clear is that we still have an uphill climb for sometime before we will see things getting any better. For now, my feeling is that younger artists have proven to be more daring (if not better) chroniclers of the depression. After the initial market shock that caused some panic, we witness an increase in the volume of their theatre activity. It suffices to say that in 2013, an economically disastrous year, the city of Athens hosted over 100 alternative productions by young people. Within that same year we had about ten new small-size theatre venues and an equal number of new companies. It is impossible to categorize them, let alone adequately present them in a single paper, for they do not form a coherent entity. Some are more politically oriented (ODC, Kanigunta, Blitz, Projector), others are more aesthetically oriented (Bijoux de Kant, Choros, Sforaris, Nova Melancholia etc). Nor do they all guarantee high quality. What unites them, and somehow makes their en bloc study possible, is their concern over the reality that the depression has created. They seem to understand that an economically and culturally threatened society requires radical rethinking. Which means that the old methods and the old mentalities won’t help to create the new spectator and at the same time re-invent culture and its dormant dynamics. They all see that new strategies—ranging from site specific works, to devised, ad verbatim, physical, etc.—are needed in order to reinvent public life and look at things as if seeing them for the first time. As Elli Papakonstantinou, director of the avant-garde multi-ethnic performance group ODC, claims, “[our] ensemble is a politically oriented group. As practitioners and as citizens of a country that stands as a worldwide ‘showcase’ for politicians and bankers and for the ongoing struggle to preserve democracy, we are motivated by an urge to reinvent the role of Art. For us, Art must now stand in the front line of opposition and questioning. 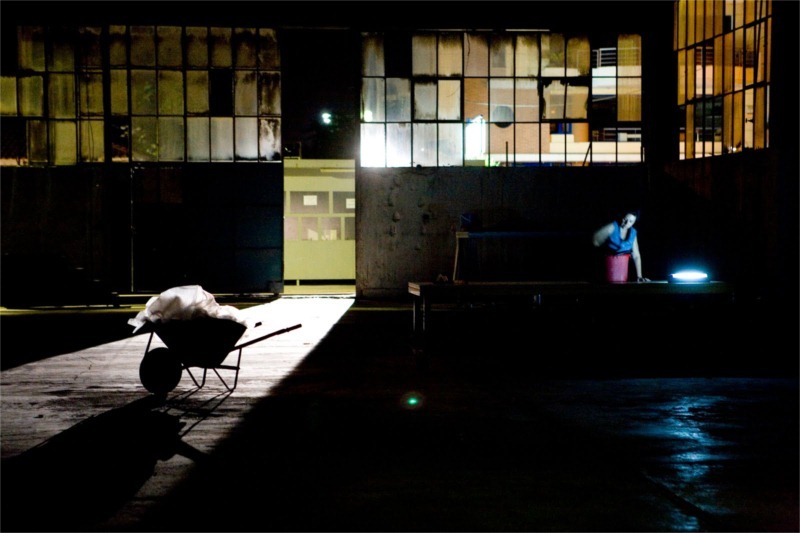 ODC’s “META,” one of the most engaging performances staged in an abandoned tannery in the city of Athens (2012). ODC ensemble creates engaged art, out of the box, in unexpected spaces and with the participation of volunteers who have no previous art experience. Our aim is to provoke, question and in times of national shock, break taboos and theatrical conventions” (www.vyrsodepseio.com). An observation that recalls Walter Benjamin’s description of the Dadaists’ art as an “instrument of ballistics that hits the spectators like a bullet” (Benjamin 1968: 197), removing them beyond their realm of understanding to a new way of perceiving actions and events. This same idea of loss is also central in their next site-specific project, Derma (Skin, 2012), a “tribute to mechanical work, monotony, mourning and apathy,” as the director claims (www.vyrsodepseio.com). By incorporating dance, music and visual arts, both performances dramatize what is going on now in Greece and the world in general and at the same time bridge the gap between the real and the theatrical, the professional actor and the amateur, the realistic and the bizarre. It is the ensemble’s answer to the question of the country’s two major national theatres, “What is a homeland?”: a series of estrangements. 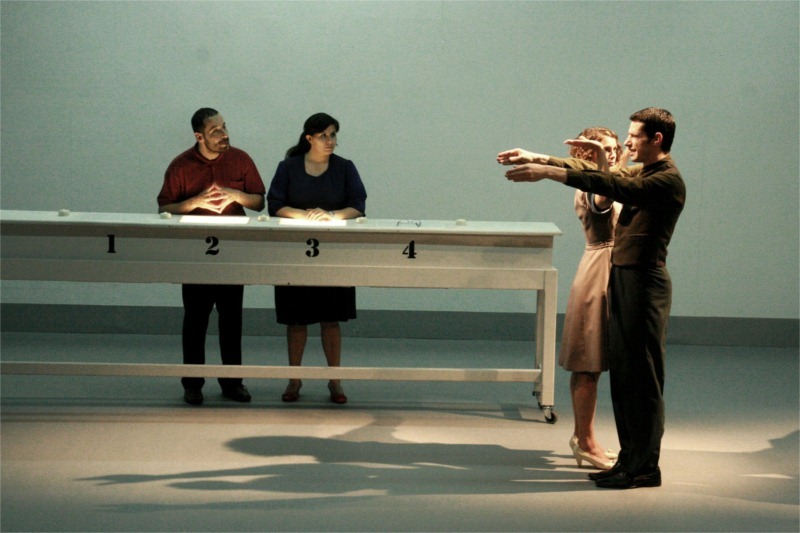 Along similar lines but with less political directness are the Blitz, one of the best-known Greek devised theatre groups, who write their texts collectively as well as co-direct and co-star in their productions. One of their better known performances, Cinemascope (2011), is an amalgam of cinema and theatre which takes place on the streets; the spectators, wearing wireless headphones, isolated behind a glass wall, watch thirteen performers live the last days of the world, along with random passers-by, who, without knowing it, participate in the performance. At the same time, they hear the thoughts of the performers along with fake sound effects that have nothing to do with what the reality they see in front of their eyes. Finally, Vasistas is another alternative actor-oriented group founded in France in 2005 by young people of various nationalities. Their performances are easily adaptable to all sorts of non theatrical milieu (roof terraces, caves, garages, etc) and they are organized to achieve maximum stage/audience proximity through the use of several spoken languages, disciplines (music, theatre, performance) and by exploring live instantaneous translation. A good example of their work is Phobias (2010), how societies are controlled through fear and spectacle, and Silence (2009), in which four actors/tellers/narrators alternate between being in the action and narrating the story of a man before, during and after his decision to change direction in his life. So far the depression has given us few works (written and staged) to get really excited about. What we mostly see are plays which develop a conscious opposition to the established forms of drama in their endeavor to widen the range of artistic, cognitive and social resources and possibilities of the theatre, both as an art form and as a social institution. At the same time, these last years have given us, besides pain and disappointment, more food for thought. They have shown that as nations change, the modes and narratives which represent them have to change as well. It is the mission of the theatre to hold a mirror up to the nation and its peoples. This does not mean that the reflection should be limited to only one version of the real. It can be multiple and multi-vocal thus providing more spaces for reflection and (de)constructive debate. Barker, Clive. “Alternative Theatre/Political Theatre.” The Politics of Theatre and Drama. Ed. Graham Holderness. London: Macmillan, 1992. Benjamin, Walter. Illuminations: Essays and Reflections. Ed. Hannah Arendt. New York: Schocken Books, 1968. Bhabha, Hommi. Nation and Narration. London: Routledge, 1990. Fuchs, Elinor. 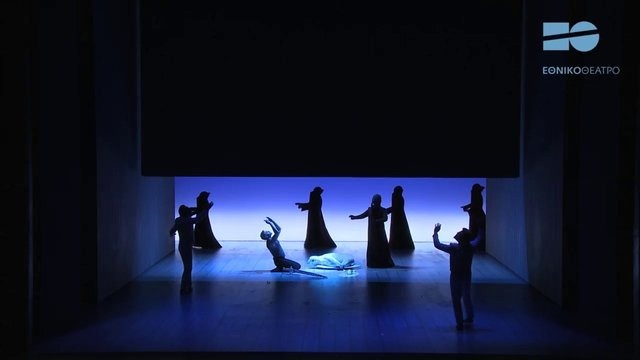 The Death of Character: Perspectives on Theatre After Modernism. Bloomington: Indiana UP, 1996. Gilroy, Paul. After Empire: Melancholia or Convivial Culture. Abingdon, UK: Routledge, 2004. Harvie, Jen. Staging the UK. Manchester: Manchester UP, 2005. Holdsworth, Nadine. Theatre & Nation. London: Palgrave Macmillan, 2010. Papakonstantinou, Elli. “Note.” www. vysrodepseio.com. March 12, 2013. Rebellato, Dan. Theatre & Globalization. Lanondon: Palgrave/MacMillan, 2009. 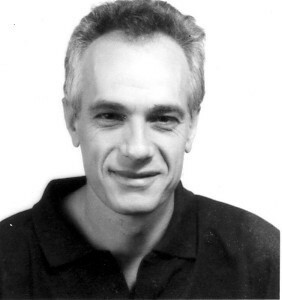 Savas Patsalidis is professor of theatre history and theory in the School of English and the Graduate Program of the Theatre Department of Aristotle University (Thessaloniki). He also teaches at the Drama School of the State Theatre of Northern Greece. He is the theatre reviewer of the daily newspaper Aggelioforos and a regular theatre commentator for the newspaper Eleftherotypia. He is on the editorial team of Critical Stages and member of the City of Thessaloniki theatre council. His two-volume study Theatre, Society, Nation (Thessaloniki: University Studio Press, 2010), was awarded first prize by the Hellenic Association of Theatre Critics for best theatre study of the year. Let me just refer you back to 1882, to Ernest Renan’s famous lecture given at the Sorbonne on the meaning of the nation (“What is a Nation?”), in which he argues that a crisis is very important in establishing and maintaining the nation; in his own words: “griefs are of more important value than triumphs” (19). For 2010 they received from the Ministry of Culture 7.6 (The National) and 7.9 (The State) million euros. In 2011 they got slightly less (7.3 and 7.4 million respectively). The bad news came in 2012 with the National receiving 4.4 million and the State 4.6, hardly enough to pay the actors’ minimum salaries. 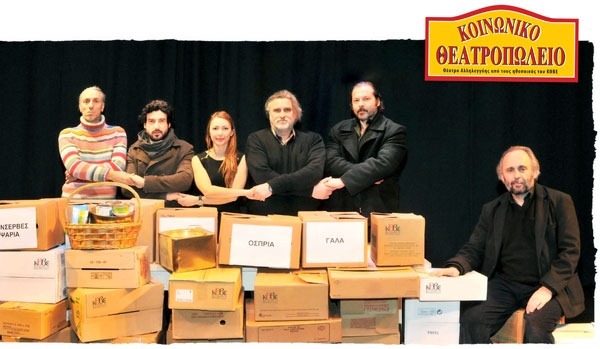 Most of the plays chosen for production come from 19th and early 20th century Greek drama, that is from the early decades of the formation of the Greek State. This shift in policy may not carry radical implications but it definitely betrays a different spirit regarding the relationship between theatre and society. 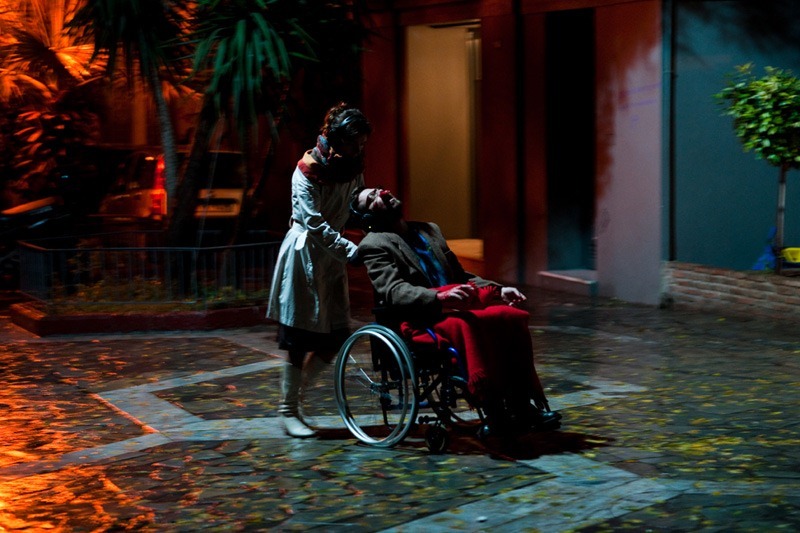 Yiannis Tsiros’ one-acter Aorati Olga (Invisible Olga) and Lena Kitsopoulou’s Aoustras e Agriada, the National’s double bill with the umbrella title:The Foreigner,” proved immensely popular at the box office. In the last five years this support has amounted to no more than three and a half million euros for non-for profit theatre—not enough, but psychologically important for it provided a kind of security blanket for artists. 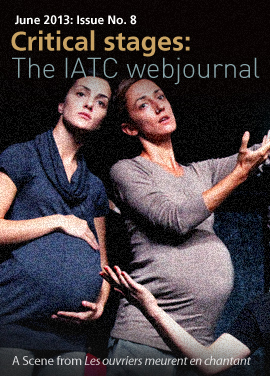 Now the future of many theatres remains bleak and uncertain. In the last five years applicants for state support varied from 170 to 200. Less than forty percent of these applications were usually approved. Big repertory companies used to get up to 250.000 euros, mid-size companies between 50 to 100.000 and small companies no more than 30.000 euros.